Elegant, modern light and airy Lodge on the prestigious Shorefield Country Park. Accommodation comprises open-plan living area with ceiling height windows and patio doors to private decking area. Lounge with sofa and two armchairs, TV and wall mounted flame effect electric fire. This is separated from the kitchen area by a breakfast bar. Fully equipped kitchen with modern appliances including double oven, 5 ring gas hob, microwave, large fridge freezer and a dishwasher. Dining table seats 4 and breakfast bar seats 2. Main bedroom has King Size bed, wardrobe and dressing table and an en-suite with shower. Second bedroom has 2 small single beds, cupboard and wardrobe space. Main bathroom with shower cubicle. Facilities on the Shorefield Park include Indoor Smimming Pool Area with Beautiful leisure pool, sauna, steam room and jacuzzi, Show Bar with entertainment, Tides Bar serving food daily. Amusement Arcade. Health and Fitness Club and Reflections Day Spa. Outside facilities include a tennis court and football area. Play areas for children. Outdoor heated swimming pool open in the Summer months. Supermarket. The Lodge is situated near to the pretty wooded conservation area with walks to the beach and Milford-on-Sea. 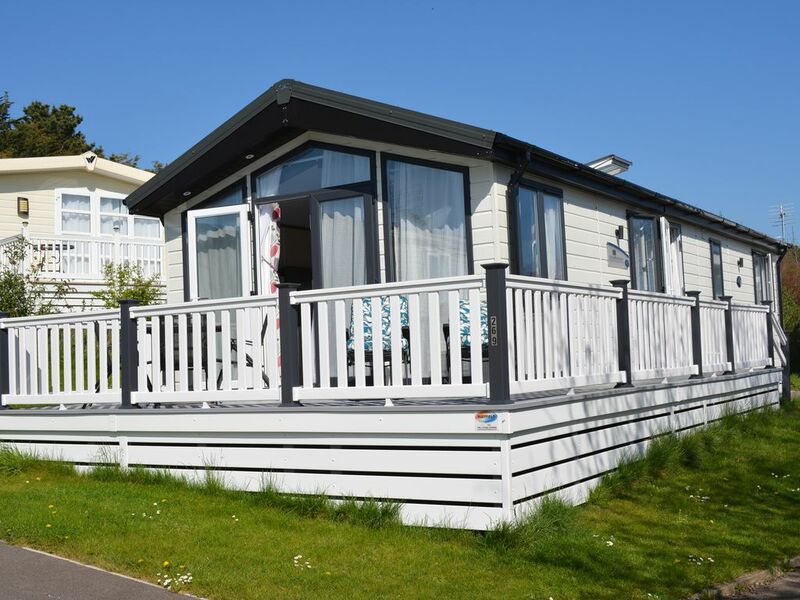 Shorefield Park is an ideal localtion for easy access to the South Coast Beaches, the New Forest National Park and ferry from Lymington to the Isle of Wight. Other local attractions include Beaulieu Motor Museum, Burley, Sandbanks, Poole and Bournemouth. The nearest town of Milford-on-Sea is just 2 miles away and there is a pretty walk through the woodland area. The larger town of New Milton is a short drive away. Laundry room at Shorefield for general use. Charges apply. Towels provided for use in the Lodge. Please bring your own towels for use in the swimming pools and gym. Fitness room available at the site - Shorefield make a small charge for it's use. Amusement Arcade at the main Shorefield building. There are two pool tables at the Amusement Arcade in the main Shorefield building. A small charge is made. Cues can be loaned from the bar - deposit required. There is a Hot Tub at the Indoor swimming pool. This amazing lodge, is beautifully furnished and is cosy and inviting. It is obvious on entering the lodge that every aspect of the interior furnishings have been lovingly put together and the attention to detail is second to none! Thank you so much Elizabeth for a wonderful stay in your beautiful lodge. Beautiful lodge on friendly holiday park. Ideal for families. We really enjoyed our NYE stay at the lodge. We found everything we needed including two showers.doshwasher,microwave and all the kitchen equipment. The lodge is on a lovely site and where the lodge is, is away from the busy reception area where the pool and bar is located and about a 20 omin wak back to the lodge ( with a 6 ur old!) the beach walk is highly recommended, it suggests 10 mins however we took around 15 due to our little one stopping to look at squirrels, it’s a lovely walk through lodges and woods, finally arriving at a breathtaking beach, we loved it . We highly recommend Elizabeth’s lodge, we had everything we could need and throughly enjoyed our time at this spotless, home from home lodge . Very modern caravan loved the sky light windows in the kitchen allowing cooking smells to vanish. Well equipped with kitchen utensils and cleaning produces also bedding and towels.It was very cosy and comfortable stay with lots of thoughtful touches e.g. throws on the sofa and Xmas decorations to make us feel at home. We had been left wine and biscuits which was a nice touch. The caravan had surround sound and a modern TV. We had wonderful stay and hope to revisit . A lovely lodge with all amenities you need for a comfortable, home from home stay. We had a great break at this lovely lodge that had everything you could want and more for a comfortable relaxing stay. We enjoyed the welcome wine and biscuits and the milk and tea were gratefully received after our short journey from London. Comfortable beds,spacious and two bathrooms were perfect for our family of four. The location is perfect with short walks to the beautiful cliff top path and short drives to the New Forest and surrounding beaches, and coastline. Also a great pub at the end of the lane for when we didn't want to cook after a full day out. Thank you to the host Elizabeth- great communication throughout and the welcome treats on arrival including some basic kitchen supplies really helped in making this a five star property.